A really basic restaurant where the player can sell off food for profit. Do not use anything from this mod in a modification you will profit from. Ever. Do not modify, convert to other games or re-upload this mod anywhere. You can use the assets MADE BY ME in your own mods as long as you give credit. Please check the credits below if you are looking for something in particular that I did not make myself. Feel free to ask if you're not sure. DO NOT USE THIS MOD AS A RESOURCE WAREHOUSE. Download the resources from the original places and ask for permission/support/credit the original authors. Links are included for everything. 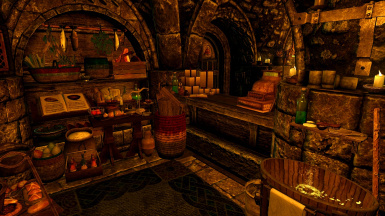 - Morrowind Style Clutter and More by The_Funktasm. FoodContainer, Alchemy Clutter and OpenBooks Resources by Blary. - Resources for modders by Runspect. - Paintings and Frames by Artisanix. - FPI Experiment Pack 1 and The FPI Aquarium Kit by The Fuzzy Physics Institute. - Noble Silver Cutlery by LilaMue. 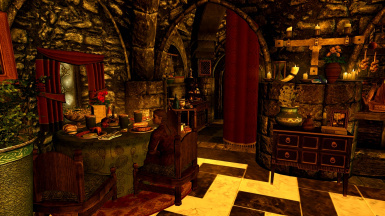 - Elianora's Extra Resources by Elianora. - Modder's Resource Pack and The Witcher Extension by Oaristys, Tony67 and CD PROJEKT. - Lolicept Resources by LOLICEPT. 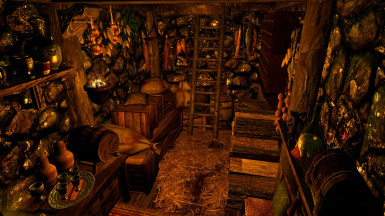 - Stroti's Treehouse resource, Stroti's Kitchen Tools resource, Static dishes and food resource, Stroti's Mushroom House resource, Stroti Resource Pack II, Assorted Resources, Phitt's Fishtank, Stroti's Craftsman Tools and conversion of David Reed's Cart by Stroti, Phitt and Tamira. - Incense bowl by jasperthegnome. - Retexture for Soup by quilb. - Antique Cash Register by RGM. - Creation Kit Tutorials and Resources by Darkfox127. - Wicker Set and Orient Set by Garnet. - Jas Better Food by Jas. - Sate That Appetite by JadeRoyale. - Resource extra food v2 by bfadragon. - Bert's Bits And Bobs and "For Sale, Sold!" tutorial by berticus0001. - Better Book Mesh and Book Covers PSD resources by DanielCoffey. - Gold hen png graphic by Gulab Khan. - Ocarina of Time by Buckles. 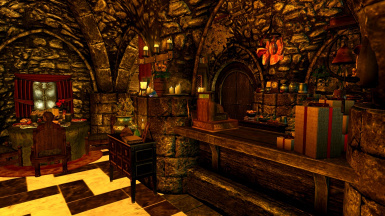 - Ready Clutter and Furnishings by lilith. - Christmas resource, tablecloths, clutter stuffs, bath towels, rugs, clocks, food stuffs, curtains, window boxes and folded blankets by InsanitySorrow. Hello everybody! 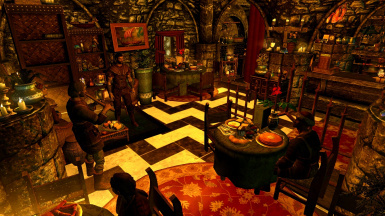 This little mod adds a simple restaurant in Solitude where the player can cook and sell food for profit. 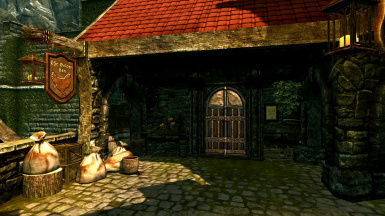 The mod is a remake/replacement of The Lofty Loft, and is located on the same spot. 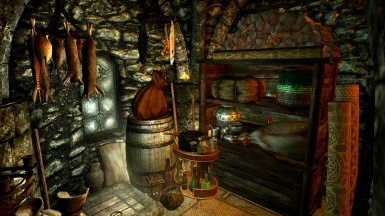 The file has been cleaned with TES5EDIT, requires Hearthfire and SKSE 1.7.3 or higher, is fully navmeshed and has only a few safe and clean scripts by the very skilled sLoPpYdOtBiGhOlE, so it should be safe for everybody to use. Still, you should always make a backup save before installing ANY mod, in case something goes wrong. 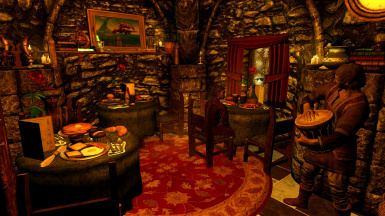 As stated above, this mod adds a very simple restaurant for the player to purchase and "manage" in Solitude, to the left of The Fletcher. I put that in quotations because all the player does is cook food and then sell it. Nice and simple. You don't hire staff, you don't build or decorate from the ground up, or anything of the sort - the place comes ready for the player to start working. 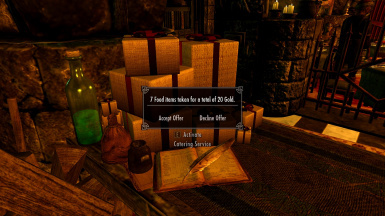 The restaurant can be bought for 30,000 gold. A book with details about the mod will be added alongside the key when the purchase is successful. READ THIS BOOK BEFORE COMPLAINING ABOUT ISSUES OR ASKING HOW TO DO THINGS. The restaurant has a map marker, although you will have to visit before you can fast travel. The place will start closed so you can take your time to look around. Open the restaurant to the public by activating the key holder by the entrance. 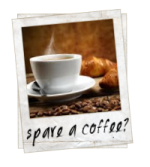 Once open, profits are made by activating either the serving cart by the working area or the catering boxes on the counter. These will parse the ingredients, drinks and food in your inventory (either raw or cooked, including mod-added meals), calculate the total price, add a small profit margin based on your Speech, and finally inform you how much you will be paid. You can agree or decline. Activate these as many times as you want throughout the day. The profit is based on your Speech skill. Basically, 100 Speech will give you 2x the base price of whatever you want to sell. 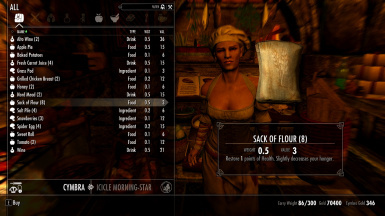 This mod does not add any new food or ingredients. The decorations on the tables and displays around the restaurant are mostly static. 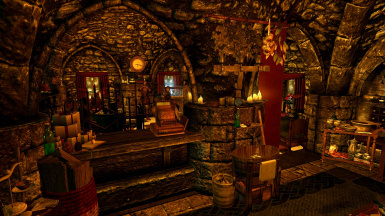 If you would like to simply have the place be a restaurant run by an NPC, summon the assistant and leave her there. 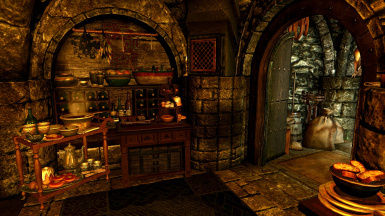 She will sandbox near the cooking area and work as a regular merchant. 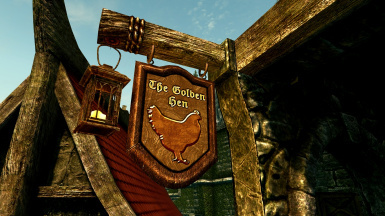 There is also a bed in the basement you can borrow so The Golden Hen can work as an inn, if you so desire. When you're done and feel it's time for a break, activate the key holder again to usher your clients and bard out. If you want to dismiss the assistant, activate the note you used to summon her. That is it. The restaurant comes equipped with a common cooking pot, a baker's pot with the same functionality as an oven, and a small tabletop grinder to make flour. All of the containers in the main floor and basement (except for the register on the counter and the trash can) are safe and will not respawn. The safe in the basement can be opened with the key obtained when the restaurant was purchased. 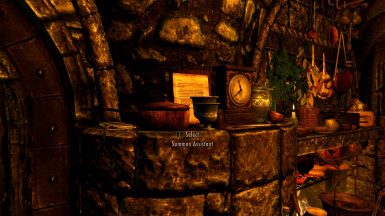 If you need some help gathering ingredients, you can summon an assistant through a small note next to the clock in the kitchen area. This assistant is a merchant who sells consumables and ingredients of varying rarity. Please keep in mind that the customers are a fixed group of NPCs. 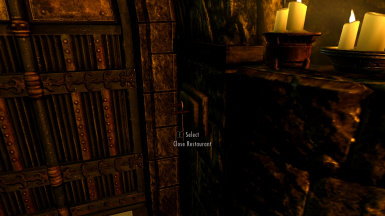 The restaurant is tagged as a public area, so if you have a mod that adds more NPCs, perhaps some of them will visit. I haven't tested for that as it was not a priority. 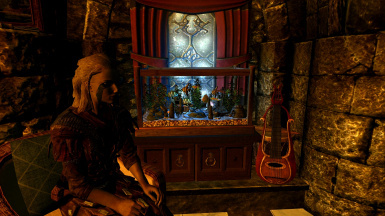 The bard can take a little while to start playing sometimes. Just wait for him to gather his thoughts, or exit the restaurant and come back in. Eventually he will start playing. He only plays instrumental songs and does not take requests. If you want to fire him permanently, you will have to do it through the Creation Kit or TESEDIT. 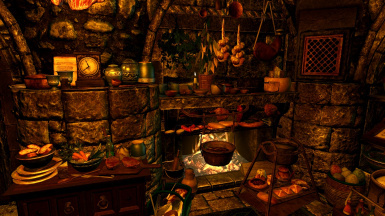 Installing Cooking for Alchemy by acdcdave1387 would be a great way to gain experience points through the cooking pot while making a profit. 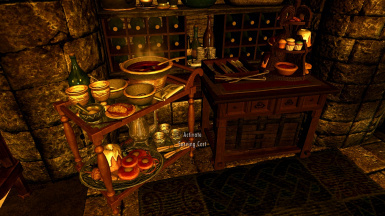 I haven't found any mods like this for Hearthfire, and in any case my cooking stations are custom, so you'll have to edit them manually if you want to get experience from them. AlterEgo's AE Animations would be a great addition for roleplay and screenshots, as well! Hoamaii's Wine and Beer In Tankards will actually make it look like your customers are eating! Also, to replace the sad-looking bread animobject that NPCs pull out while sandboxing, I personally use a combination of Hoamaii's Meat Sandwich mesh and JadeRoyale's Talos Sandwich texture so it actually looks like they're eating something tasty. 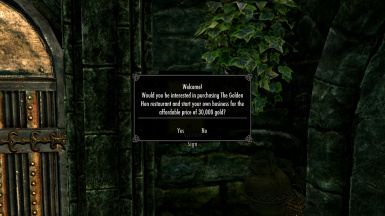 Finally, I would heartily recommend to install a mod that reduces NPC greetings, such as No NPC Greetings by Cipscis, because otherwise you may go insane with the customers constantly talking to you. As stated before, this mod is not compatible with The Lofty Loft, as both mods put a door in the same place. I don't think you'll crash or anything, but using the two mods at the same time would probably be silly. 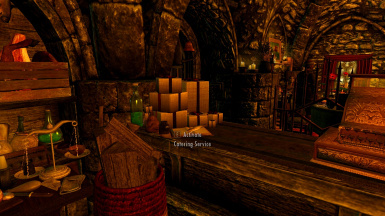 About compatibility, I am using several mods that edit Solitude and have not found any issues. I also didn't have any negative reports about the Lofty Loft - the bug that removed a door in Angeline's Aromatics has been fixed. But if you find a problem, please let me know so I can list it here. To install, extract the contents of your downloaded file to your "Steam/SteamApps/Common/Skyrim/Data" folder. Then activate the mod through your preferred launcher by ticking the checkbox next to the esp. Or you can use your Mod Manager of choice to download the mod automatically. To uninstall, simply delete the files from your Data folder, and you're good to go. - THIS THING IS TOO BASIC! I DEMAND YOU ADD [insert elaborate game mechanics that would require hours of implementation] OR I WON'T DOWNLOAD/ENDORSE/GIVE YOU IMAGINARY INTERNET POINTS!! - When I use the activators nothing happens! What's going on? - Make sure you have the latest SKSE installed. This mod requires SKSE 1.7.3 or higher. - HEARTHFIRE WORST DLC EVER! Non-Hearthfire version pls! - Does the mod recognize mod-added food and drinks? - I wanted to use the grinder and the game crashed, what's with that? - No idea. 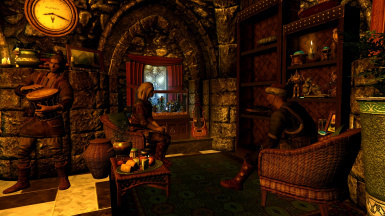 It appears to be related to the Skyrim Romance Mod. I was unable to reproduce the issue - it seems to only happen to some people and not others. If it happens to you, you can make the grinder static so you don't activate it by accident by opening the console, targeting it and entering the command SetDestroyed 1. This will turn it into simple decoration. - I went looking into the mod and I saw your scripts! I don't like scripted mods! YOUR EVIL SCRIPTS ARE KILLING MY GAME! Remove them at once! - I don't like the new crafting stations! They make no sense or something! Change them! - Does the little bell do anything? - No, it's just for decoration. - The new textures are too low res and ugly! I cannot stand this! - I don't like [NPC added by the mod]! REMOVE THEM AT ONCE!1! - I hate everything being static! I wanna pick things up! - I'm lagging all over the place! Help! - I tested this mod on a heavily modded setup, on a mid-range gaming laptop. I had no performance issues. But, due to all the stuff on the shelves, if you're playing on a coal-powered machine you will definitively have some performance loss. Feel free to edit the mod and remove some things if you cannot stand it. - Can I use some of these files on my own mod? - A bunch of things I'm using are already modder's resources, so just look around the credits tab to look for what you'd like to use. If you cannot find the thing you want there, it probably means I made it myself. Feel free to ask if you're not sure. - Is this compatible with [insert mod here]? 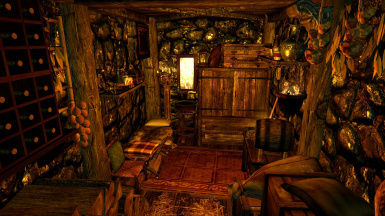 - If you have a mod that makes heavy changes to Solitude there could be issues, although the mod is as clean as it could be. If you find any conflicts, please let me know so I can list them here. - How come the mod looks different in my game than your screenshots? - I am using several retextures in my own game and my own SweetFX preset, so results may vary.